Resistance | "blackberry-eating in late September"
There are 3½ weeks to go until my whole dissertation is due to my committee. I’m through revising three of the six chapters, and embarked on the fourth this morning. Dinners vacillate wildly between complex assemblages of roasted vegetables with ancient grains, comforting cheese-laden casseroles, and baked potatoes with steamed broccoli. My Bittman file (yes, I keep the selections in a manila folder, wouldn’t you?) is buried somewhere under piles of criticism on medieval theology and monographs about poems you’ve never heard of. And the selection I have to share wasn’t my favorite. As usual, these things combine to mean I have all but zero motivation to post. But I’ll do it anyway. For you. Because this project needs completion. This sounded intriguing, so I decided to pair it with a dish my friend and colleague J. calls “scatter sushi”: all the ingredients you might find in your favorite roll diced small and integrated into a bowl of well vinegared sushi rice. 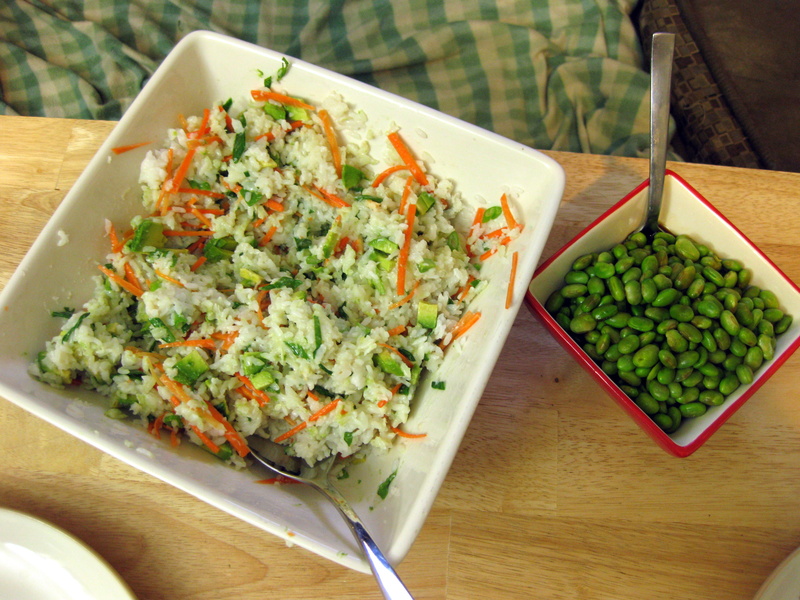 Ours had carrots, green onions, crumbled roasted seaweed, avocado, and crab meat. I’ve also made it with shrimp (when N. was out of town, of course), and it’s delicious. 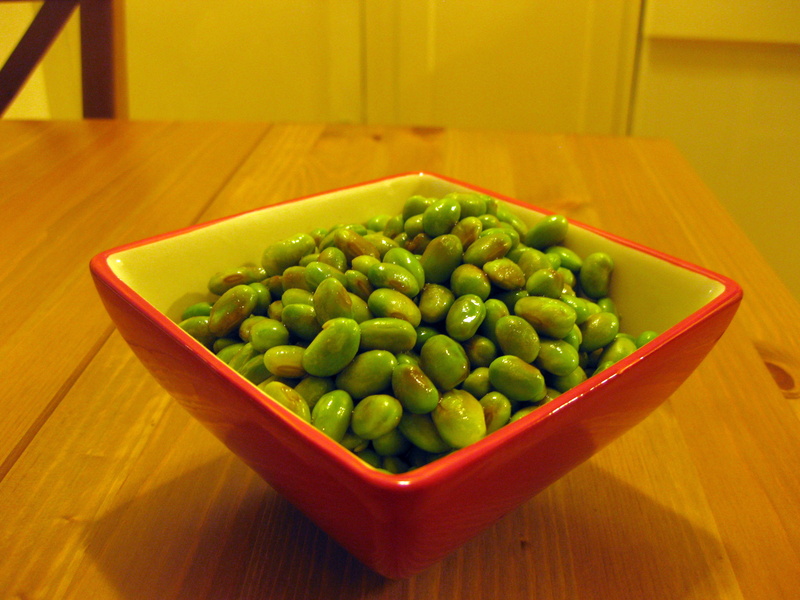 As the edamame were blanching, draining, and cooling, I mixed the other ingredients together in a small saucepan and brought them to a slight simmer. The sauce took a minute or two to thicken, and once it was barely viscous I drizzled it over my bowl of beans and served with a slotted spoon. This had promise, but in its current form I think it fell a little flat. I didn’t love the slippery slickness the cornstarch imparted to the dressing: it clung to my lips and tongue in an unappealing way. Or maybe there was just too much of it. I think this concept would realize its potential if it became part of a full salad stuffed with brightness and texture: red bell pepper, finely julienned carrots, green onion, maybe even grilled tofu or roasted sweet potato or chunks of firm-fleshed white fish. It needed only a light dressing, not the soupy drenching I gave it. And maybe the sauce didn’t even need the cornstarch. I recognize its thickening purposes, but couldn’t the soy sauce just be reduced a bit instead? This entry was posted in Gluten-free, Recipes, Rice, vegetarian, Veggies by Chelsea. Bookmark the permalink.